This is probably the first time you have seen Fuchsia venusta. 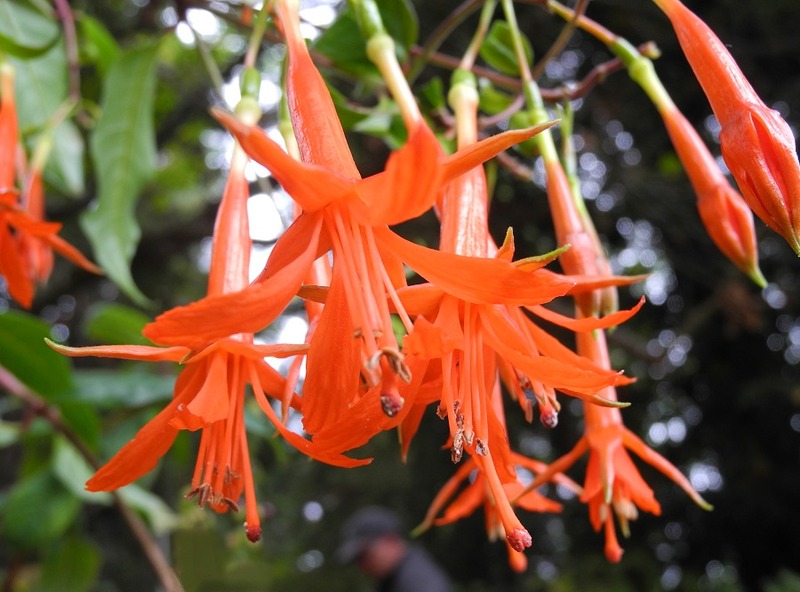 This is one of the nicest Fuchsia species, with its large clusters of vivid orange blossoms, as well as glossy foliage. This attractive bush comes from cloud forests of Colombia and neighboring Venezuela. The plant is very rare in cultivation, even among botanical gardens. I don't know anyone else currently offering it! 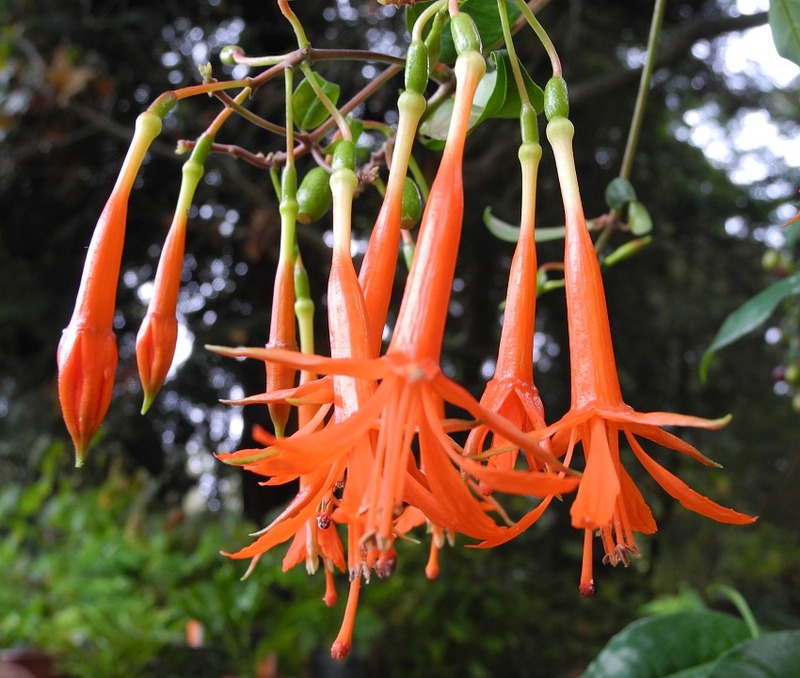 Fuchsia venusta forms an open, evergreen bush with arching branches that grow 4 to 6 feet long here in San Francisco. It blooms most months of the year, with clusters of 2 inch flowers at the ends of the branches. The graceful blooms have a long, narrow tube and flaring sepals that attract hummingbirds. After flowering, it makes purple fruits that are edible. They have a lightly-sweet taste, making them a nice treat while wandering through the garden! This is a true species, not a cultivated hybrid. You might be able to cross-breed it with some other Fuchsia species to create new hybrids. It is easy to grow when given the right conditions. Like most Fuchsias, it prefers mild daytime temperatures and cool nights. It can tolerate warm days provided that nights are cool. I don't know if it will thrive if temperatures regularly get above 85 degrees F (29 C) and nights are above 65 degrees F (18 C). I don't think it can survive temperatures below freezing. It enjoys filtered sunlight or morning sun, with protection from strong afternoon sun. It grows well in a pot in fertile, well-draining soil that's kept moist, similar to other Fuchsias. Over about 40-50% humidity is best. This species is resistant to Fuchsia mites.